Ferruccio Rossi, North American country manager for the Ferretti Group — which comprises Ferretti Yachts, Pershing, Itama, Bertram, Riva, Mochi Craft, CRN and the Custom Line — said the group as a whole is developing 42 models that will debut between the end of this year and the end of 2013. He noted that sales are up and that the company remains committed to the North American market. “America is the most exciting market in the world,” Rossi says. Alton Herndon, CEO of Bertram Yacht, said the builder has sold 12 boats since its 50th anniversary celebration in April and that signs of life are evident. “The old inventory has sold — and that’s a big deal — and we’re developing a backlog of orders,” Herndon said shortly before Ferretti showed a flair for theatrics by steaming its new Custom Line 100 past the Ferretti Group Flagship Showroom on S.E. 16th Street to highlight the yacht’s world debut. Jim McManus, president and chief executive of The Hinckley Company, said the Maine builder’s next yacht will be the Talaria 34, which he described as beautiful, fun and simple to operate. The new design “offered an opportunity to create the best dayboat ever,” McManus told the media. Don Smith, vice president of sales, said the company’s new 36 Express, introduced this year, is a “very important boat for the Cabo brand.” Smith said the 36, rigged with duel ZF pod drives, fills a market niche for the builder and might be a good first boat for Cabo customers. At a press event, David Hensel, director of brand and marketing for Grand Banks Yachts, said sales are up compared with 2010 and that the builder came to the show with a head of steam. “We’re seeing [our] markets pick up all around the world,” Hensel says. Grand Banks displayed four boats at the show and announced its next boat, a 54 Heritage EU trawler, will debut next year. In the Electronics Tent, technology and innovation led the charge. Fusion, a New Zealand company with an Australian CEO who was an executive with Navman electronics, debuted its 700 Series integrated multifunction marine stereo units and the compact MS-RA50 marine stereo. CEO Chris Baird, at a press conference in the Yacht & Builders tent, stressed that what distinguishes the company is that its audio products are designed for the marine market and engineered for quality. The company provides OEM speakers, digital players and other entertainment components for Regal, Monterey, Ranger Tugs and other builders. Baird hinted that digital video is the next step for Fusion. Navico, parent company to the Lowrance, Simrad Yachting and B&G brands, unveiled its third-generation broadband radar, the Broadband 4G, just six months after the 3G debuted. The new system offers 50 percent greater range (as much as 24 miles) and can clearly display objects less than a foot away, according to the company. “We’re the only manufacturer in the recreational market offering broadband radar,” marketing director Gordon Sprouse says. Nobeltec introduced its Time Zero Trident “ultra-fast” cartography engine with software the company said was built from the ground up based on significant customer comments. The crisp graphics feature full-time 3-D displays, high-resolution satellite photos, and raster and vector chart overlay for radar and sounder data. The system reacts in real time and can display the weather conditions that lie ahead, based on a vessel’s course and speed. Thetford Marine displayed its innovative Porta Potti Curve, a reboot of the venerable product the company invented in the 1940s. The design offers higher seating, a larger bowl, battery-powered flush, a holding tank indicator and an integrated toilet paper holder. The product won an Innovation Award at IBEX and is nominated for a DAME Award at METS. The show remains an outlet for alternative builders such as Bruce Barsumian, the founder of Axcell Yachts. The Floridian says he always liked European-style boats and the efficiency of multihulls, so he created the Axcell 650, a power cat with HybridAir technology in which a turbine pumps air into twin air-cushion cavities to “literally lift the hull” and reduce friction and drag. Barsumian says he’s looking for a building partner for the project, which he estimates at a $3.4 million base price. “I’m just a builder who built this for myself,” he says. 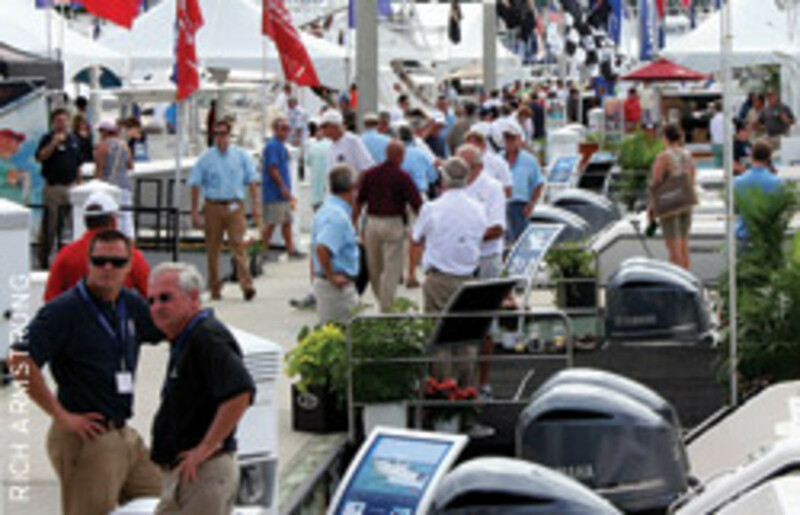 Eastern Yacht Sales, of Massachusetts and Rhode Island, displayed the SmartBoat, a modestly powered foam-cored 23-foot European center console that the dealer recently adopted as North American distributor. “You can dive from it, fish from it, and it makes a nice day cruiser,” says Sean Willis, a sales and service rep for EYS. The unique boat burns about 6 gallons an hour cruising at 26 mph with a 115-hp Yamaha 4-stroke, according to Willis. Down on megayacht row, L. Bruce Jones, CEO of Triton Submarines, drew a crowd with one of his ABS-class luxury deep submersibles designed for large luxury yachts. The sub seats two in a transparent bubble, where they can steer the vessel with joystick controls and maneuver its five-axis manipulator arm.